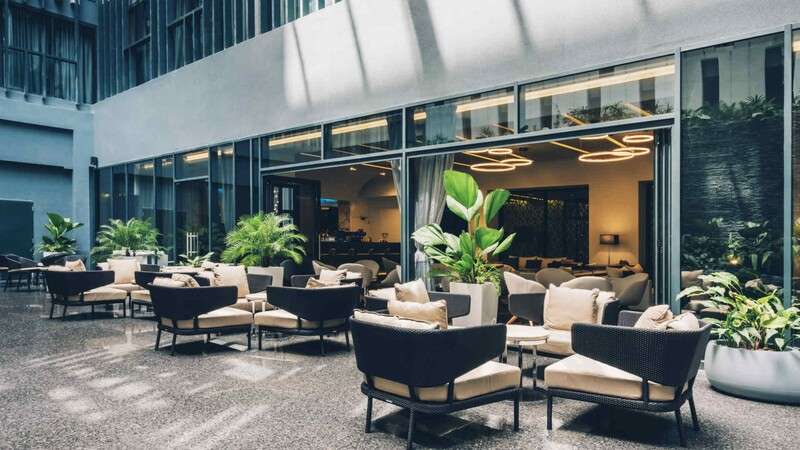 Perfectly situated in the historically rich Old Havana neighbourhood, the Iberostar Grand Packard offers modern amenities, a luxurious atmosphere and a glistening infinity pool. 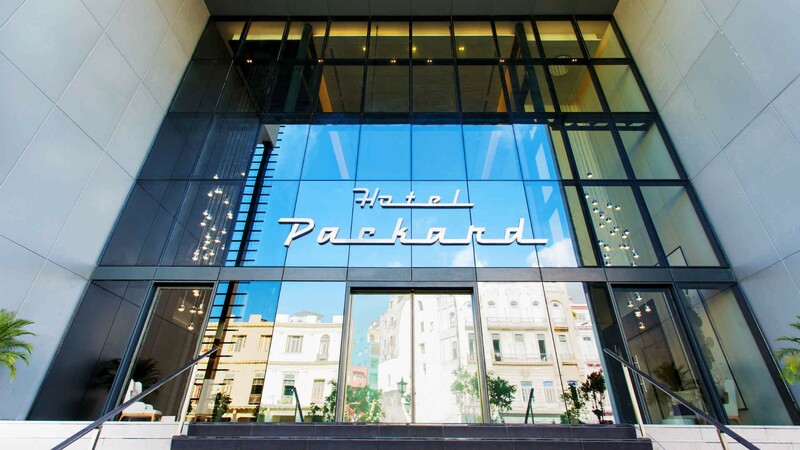 Outfitted with dark glass windows and starch white columns, the Iberostar Grand Packard stands out like a glistening pearl against the backdrop of Havana’s well-worn, pastel-coloured colonial buildings. A small section of the building sports a colonial-style façade, but even this looks too new to completely blend in. 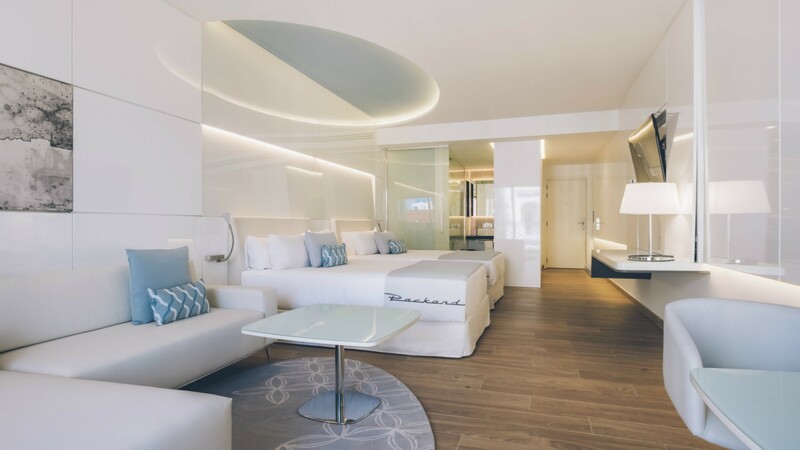 Sleek and modern, this hotel is all about luxury. In the lobby, a sprawling entranceway, high ceilings and contemporary furniture create a glam atmosphere. Throughout the hotel you can enjoy breezy air conditioning and high speed WIFI – two commodities that are often hard to come by in Cuba. 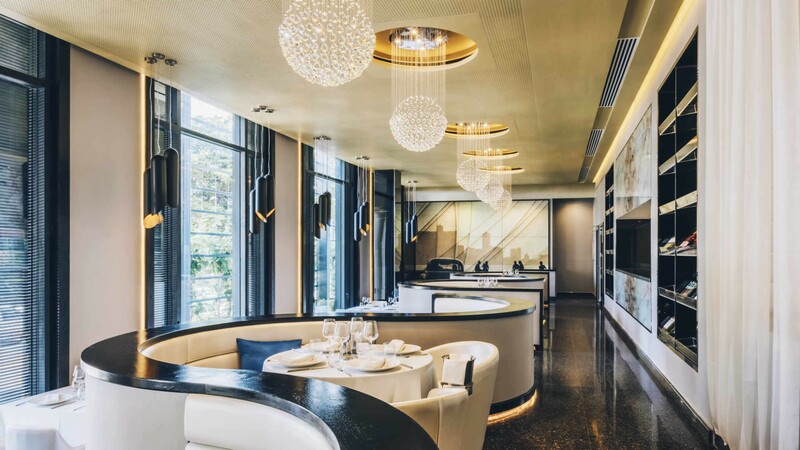 Each room extends the hotel’s glossy aesthetic. Bathrooms feature double sinks, a water closet and a rainfall shower. Deluxe, Deluxe Premium and Star Prestige room options offer varying levels of spaciousness and choices to have additional amenities like a whirlpool bath. Enjoy ocean views from the Deluxe Atlantic room or take in all the action on the promenade below from the Deluxe Prado room. Other features include automatic closet lights, a Juliet balcony and a bedside iHome outfitted with both micro-USB and lightning for all your charging and music-playing needs. 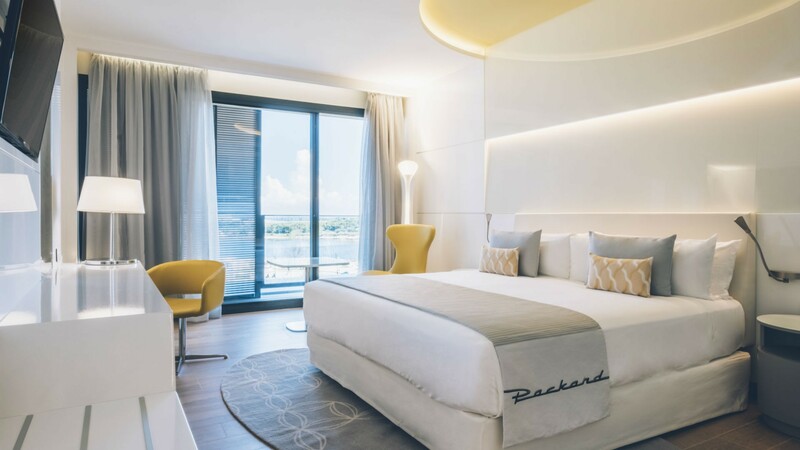 Home to three different bars, five restaurants and a spa complete with jacuzzi and sauna, the Iberostar Grand Packard is a luxury hotel with the feel of a resort. Included in your stay, a full buffet breakfast is offered every morning with fresh fruits, pastries, an egg station and more. For an additional cost, dine at Biscuit gourmet restaurant, Tradiciones Cuban restaurant, Español tapas restaurant or the poolside snack bar. In the smoky cigar lounge, puff on a Cohiba or a Montecristo. 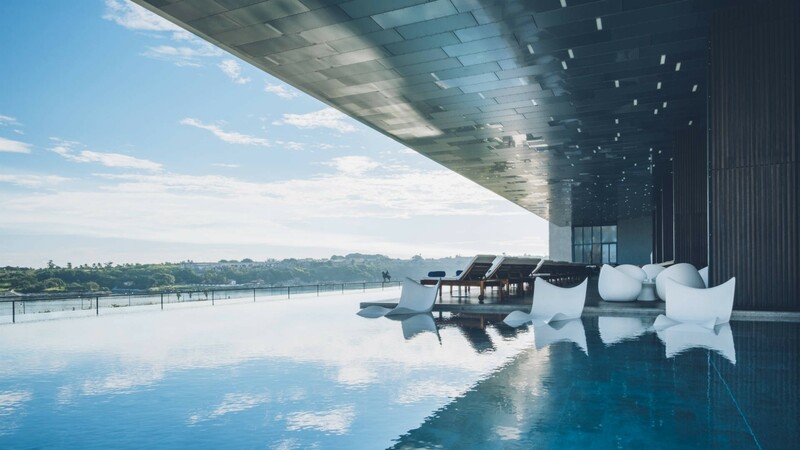 On the sixth floor, the crystalline waters of the outdoor infinity pool appear to stretch right into the strip of ocean that can be seen on the horizon. Lined with half-submerged loungers and completely shaded by the floor above, the pool is the best place to beat the heat when temperatures climb. Sun worshipers can soak up the rays in the late afternoon when the sun is low enough in the sky to shine in. Order the strawberry mojito or a piña colada from El Faro Pool Bar and curl up on one of the many daybeds, loungers or couches surrounding the pool. The L-shaped terrace is also home to a designated dining area where guests can eat from either the Snack Bar or Tradiciones Restaurant menu. A small platform doubles as a spot for morning yoga classes and a stage for nightly outdoor entertainment. In Old Havana by the waterfront, the Iberostar Grand Packard is the perfect home-base for exploring the rich culture of Cuba’s capital. Laughter, music and the thwack of skateboards hitting the pavement can be heard at all times of day coming from the tree-lined Paseo del Prado. Just outside the hotel, this promenade is a gathering place for locals from school aged children to adults. Walk along the Paseo del Prado to get to the Capitol building, then follow side streets to find shops, stalls, food vendors, bars and restaurants. Within a 15-minute walk from the hotel you’ll find sightseeing destinations including museums, cathedrals, town squares and tourist attractions like El Foridita Bar, Ernest Hemingway’s favourite spot for a daiquiri. 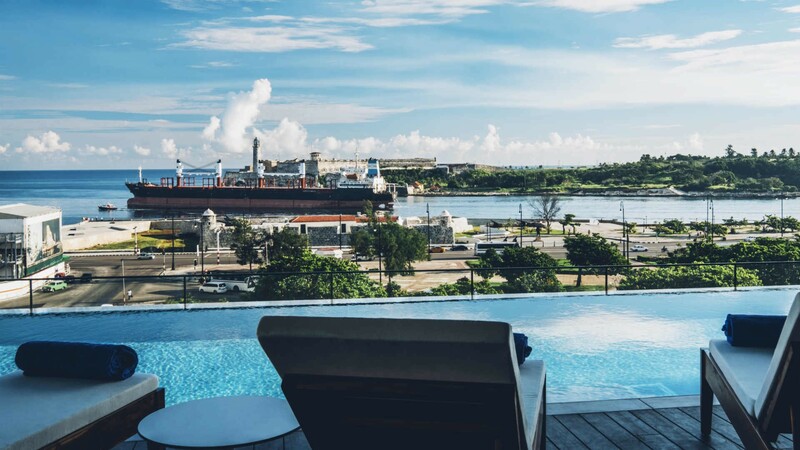 For ocean views, the Iberostar Grand Packard is a five-minute walk from the Malecón, the seaside boardwalk that stretches along the outside of Havana for miles. Rooms from $500 a night.